So I decided to pick up Runic Game's Torchlight last night. To be honest I hadn't heard much about it until one of Kotaku's commenters mentioned it in another post. Since first hearing of it, I checked out the site briefly, read a couple interviews and after finding out that it would only be $20 I figured I couldn't really go wrong. I was a little skeptical at first - open source engine, small team, limited budget - but I'm happy to say now that it exceeded my expectations in many ways. For those who don't know, Torchlight is what we all lovingly refer to as a Diablo clone (Maybe FATE clone is more appropriate here), but Runic took it a few steps further. Building upon what the designers no doubt learned from the design of the FATE series, there are a handful of interesting features included that I would not be suprised to see Blizzard poach for Diablo III, and a few that could teach the problem child MMO genre a thing or two as well. It's not all epics and lulz though, as there are some questionable design decisions that left me wondering, and the lower budget of the game shows through a little too clearly in some areas. I bought the game on Steam, which as always was easy, simple and at only ~800MB, extremely fast. After starting it up I went straight through to creating my character. You can choose to play as one of three classes (Destroyer, Vanquisher and Alchemist) with one of two pets (Dog, Cat). On my first play through I chose to play as a Destroyer which is your typical melee Warrior/Berserker type and chose a Dog for a pet. After a brief dialogue to set the mood, you're in Torchlight with some starter equipment. The town itself is more or less your standard every day RPG town consisting of some merchants, some flavour NPCs and some shiny exclamation points to guide you in the right direction. For anyone even slightly familiar with this type of game, you'll feel right at home. (unfortunately for me I hate living in the house that WoW built). After discovering that evil_force_001 is corrupting the town's main source of livelihood, the "Ember Mine", the plan is fairly simple - take on quests that send you further and further into the mine to discover the source and save the tiny little world of Torchlight. There are some twists and turns here and there but I don't want to spoil anything. Suffice it so say that if you're looking for epic storytelling and hoping to cry like you did when Aeris died, you'll have to look elsewhere. This isn't necessarily a bad thing for a game like this, but it wouldn't have hurt to have leaned a little more in that direction since the game is single player only. The game is largely mouse-driven. Click to move, click to attack, click to loot. There are also various function keys that allow you to augment your clicks; ctrl-click to have your pet loot something for you, shift-click to stand in place while you attack etc. This brings me however to one large oversight in the design - there is no way to change your key bindings! In a console game it could be forgiven to some degree, and the controls are adequate as is other than some odd choices (left clicking a hotkey attempts to change the ability instead of using it?) but with how much PC controls can change, and in a game with many different abilities/items such as this, not allowing players to adjust their key bindings is just lazy. You are able to choose which of the 1 through 9 keys do what (by left clicking them!) and you can assign skills to the left and right mouse buttons, but it ends there. Key mapping issues aside, the interface is quite nice, right up there with Blizzard's UI design. There are a few things that feel like they were rushed, or just not thought through completely - for example after being trained to right click the hotbar buttons, I often right clicked merchants which simply triggers whatever action you have bound to right click (in my case charging through the merchant face first into the wall behind them) but overall it is very clean, and easy to navigate. One area that could definitely use some improvement though is enemy health bars. The bar itself is at the very top of the screen, which is generally not where you're looking. It's hard to determine when they will show up and when they won't. Mousing over an enemy sometimes shows his health, other times it doesn't depending on what specific part of the mob you mouseover, and where they are on the screen and trying to pick out a specific mob in a pack and see how much heath it has is also very difficult. Ideally I'd have liked to see an option to toggle the name plates for all the monsters off and on at once, or allow the health bar's position to be changed to somewhere more comfortable. This problem is compounded by the clipping distance. The environment renders perfectly as far as you can see, but mobs phase in and out of existence around the edges of the screen. It's not a big enough problem to really detract from gameplay, but as the game has very low system requirements in general I don't see why we aren't offered an option to increase this if our system has no problems running the game. One last little gripe I had with the UI was the lack of defensive buff icons. Many class abilities, or defensive skills will last a certain amount of time before needing to be refreshed, granted they generally have particle effects so that you can visually see when a buff has worn off, but when you're in the middle of thirty skeletons, it can be hard to see. A simple buff bar showing the defensive spells currently active on you would work wonders. 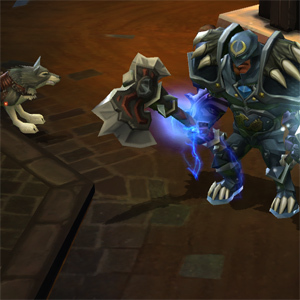 Once you get used to the controls, Torchlight plays like most other games of the genre. Slay monsters, gain levels, fame and items... LOTS of items. In fact the number of items is somewhat ridiculous. I think you spend as much time looting and identifying magical items as you do fighting which seems a little bit off, and if it weren't for your pet's ability to run back to town and sell trash items for you this would be cause for nerd-rage. In an entirely single player game there's really no reason for it, no one will be using grey items past the first level of the dungeon and if you're trying to ensure that players have enough gold, just make more gold drop from monsters. Even the low end magical items become useless relatively early on and you're left sifting through a sea of items for purple or orange names. It seems almost as if someone came up with the idea that your pet could run to town to sell for you and they wanted to make sure you used it. I would prefer if he could dig up potions for me. 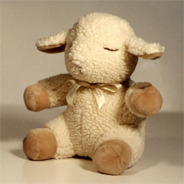 The pet is your typical RPG pet - constantly getting stuck and frequently trying to solo things that it clearly can't. To be fair it's usually pretty good at keeping up with you, and not getting into TOO much trouble but on some of the more complex levels it does gets stuck a fair bit. In addition to the aforementioned ability to load up its inventory with things you don't need, and have it run to town to sell it for you, it can even learn spells and use certain items which adds a little bit of extra character customization. The pet uses a system of control like WoW's where you can set it to be Defensive, Passive or Aggressive and it will act accordingly. As far as pets go it's not too bad. It walks that ever so fine line of being useful without being too annoying, a line that most RPG pets sprint across into a pack of mobs on the other side of the map and run back to you screaming for assistance. That or they just die, constantly. In Torchlight if your pet gets too low on health it will flee, running to safety and saving it's life until you can feed it a potion or some fish. Potion for health, or fish for random effects - different fish cause it to look differently and gain certain strengths and weaknesses, although this is more of a novelty than anything else as I never really found a point in time where it was needed. The fact that fish aren't very useful though, is probably a good thing because if I found myself requiring fish at any point I would lose it. 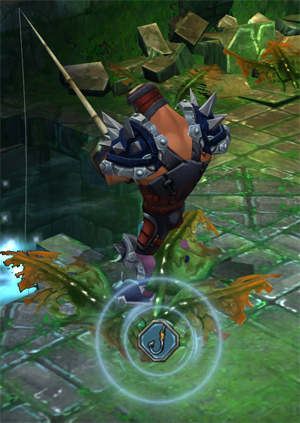 Fishing itself is ridiculously boring. I suppose there are some sick individuals out there who may enjoy it, but it's basically like playing Rock Band one note at a time, on easy - with no music, and I hate Rock Band. The character advancement system is fairly standard. Gain levels, earn attribute points to buff your Strength, Dexterity etc. and skill points to put into learning new abilities, or buffing existing ones. 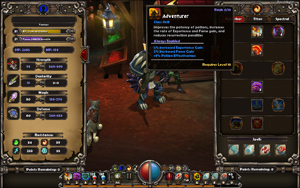 There is also a secondary leveling resource, Fame, which increases as you complete quests or slay random named bosses. When you earn a level in fame you earn an additional ability point and a new title, but no attribute points. The two systems work well together, and it would be interesting to see something similar implemented in MMOs to provide another progression path to the raiding crowd in addition to standard experience. My only real complaints about the character advancement is in the skills themselves which I'll cover in more detail later on, and that fame doesn't really do anything for you. It would be nice if higher levels of fame opened up additional quest NPCs, or special merchants, something to make it feel like fame and not just half a level. The combat itself is more or less what you would expect from this type of game, constant clicking, and some keypresses thrown in. The abilities are a little bit lacking (keeping in mind I've only spent time with the Destroyer). There are a couple that are interesting and fun to use, but other than those few, the trees seem filled out with flavour skills that don't really change the way you play but simply add damage, a pet, or grant passive buffs (like one that decreases the death penalty?) they just feel a little bit thrown together. Each tree lacks it's own distinct feel, and they're really more a collection of leaves on the ground than they are trees. You are only required to be a certain level to put points into a certain ability, there are no pre-requisite skills or point requirements. In spite of these issues, the combat remains fairly entertaining initially. Smashing through groups of mobs and watching their bodies fly through the air is amusing for some time but I felt that it started to get a bit repetitive around the 20th level of the main dungeon. One of only four quest NPC's started repeating quest descriptions at that point which just seems lazy (should at least have had enough to complete the main storyline without repeating). The quests they offer aren't really sidequests so much as additional rewards for going to dungeons you had to go to anyways, which is fine really, but the rewards seem a little bit off. It seems to almost just randomize the rewards which is a little silly because chances are you received a better item while clearing the dungeon than what you will get for completing the quest. I would have liked to see a unique resource used as quest rewards to make them more useful, perhaps buffs that would last for the next thirty minutes, or potions that provided a unique buff. Something to make completing the "sidequests" feel more like additional advancement, and less like exp/fame padding. The main issue I have with the combat, is more of a genre problem than a problem with Torchlight itself, but I was still disappointed to see no attempt at resolving the issue through design - health pots. What is it with these games and health pots? I personally enjoy trying to play without using potions, and am frustrated when a game seems designed for you to just gulp down potions at the first sign of trouble. Using potions doesn't feel fun, it feels like cheating. There should at least be some damage penalty or something to encourage me to use my abilities to survive and not just stand in the middle of everything, spamming area attacks and gulping down potions, which, by the way seems to be the best strategy for every boss. And that brings me to my next point - boss encounters. I am typically an MMO nerd where boss encounters can be complex, scripted events where you have to use coordination, timing and the proper equipment and skills to win, but every boss in Torchlight seems more limited by how many health pots you have than anything else. Sure I could win with no pots, and maybe it would require some skill and proper play, but why would you when you can just brute force the whole thing with potions? Allowing potions to exist in this form negates so many of the enemy attack mechanics that it's just ridiculous to leave it as is. In fact I think the only time potions failed me were around level 22, where some of the Goblins shoot explosive arrows at your feet. If you just stand there, you would die and that made it exciting when you lived. Charging out of the way of the arrows before they exploded was fun! pushing "3" over and over while spamming cleave, was not. This is the kind of ability that needs to be included more often. Especially during boss fights. There needs to be areas where if you make mistakes, you will die. Potions should be a last resort, not a rolling buff. I was playing through on hard, and it wasn't until the final 3 floors of the main dungeon that I actually felt I had to use my abilities properly in addition to using potions in order to survive. I recall one fight specifically where three bosses spawn at once, with some dialogue from each announcing their awesomeness. My initial thought is that there's going to be some sort of strategy, maybe I have to kill them all at once? Maybe they will resurrect each other? - Nope! Round em up, get your finger over the potion hotkey and go to town. I am a skilled Destroyer. Overall I feel that the combat and character skills design was probably the weakest part of the game. Luckily for Torchlight there is something inherently fun about the click, click, loot formula, so as long as it's presented nicely it almost doesn't matter - It was fun, which is the main point, but as far as combat design goes it really is somewhat lacking. This is an area where I was surprised to see so much polish. Often with lower budget games the graphics, sound and music suffer a lot. I was especially surprised in the case of Torchlight where an open source engine was used (Ogre 3D). The game's graphics have a slightly cartoonish feel which works well with the less advanced graphics engine, but still manages to feel realistic enough to take seriously. The animations are very well done, and through the whole game I didn't notice more than a handful of minor graphical problems. The music and audio are certainly above average. The music will be instantly familiar to anyone who has played Diablo as the music was done by Diablo's composer, Matt Uelmen and is in the same vein. The voice acting is decent, but if it were a game with more focus on the plot I would expect a little more. Sound effects are solid, never feeling repetitive and always giving a satisfying crunch, or slice where you would expect it. The are only a couple of real technical issues. The first and most noticeable of which is loading times. For a game as relatively simple as this the loading times seem extremely long. I'm not sure if this is a coding problem, an engine problem or what, but I hope it's worked out. The only other issue is pathing. Mobs give up chase pretty quickly you if you run away, but if you had the desire, it's extremely easy to catch mobs on ledges or behind gates and shoot at them while they stand there awkwardly trying to reach you. Things like this would need to be resolved for the upcoming online version of Torchlight as it would be far too easy to exploit. The main "storyline" is decently lengthy, and once you're done with that there is an endless, randomly generated dungeon for you to continue leveling/looting.. but as the main plot comes to an end, I can't help but feel that it's unlikely for me to continue playing too much afterwords. I may play through as one of the other classes, but ultimately as a single player only game there just isn't enough depth to keep you interested for more than one or two plays through. Don't get me wrong, I had a great time doing it, and for the asking price it is completely worthwhile, just don't expect it to take up a standard rotation in your game playing after the first week or two of your purchase. Torchlight is a fun game, with some great features that take a little baby step forward for the genre. It's not going win any best in class awards, but it is solidly above average in every aspect. If you're looking to pass some time while waiting for Diablo III, or just kill some time in general and are tired of sitting around in Dalaran, Torchlight is a good option and it's a fantastic start for Runic Games. More heavily scripted/complex encounters that actually required tactics. More interesting skill trees. Many abilities felt useless, or out of place. Skills that build off of each other, or are intended to be used in tandem would add a lot of depth to the combat. Increased difficulty - I played through on Hard and felt like it was too easy up until the final section. Torchlight is pretty good, for the low price I would definitely recommend it if you're looking to kill some time. I can hold out till Tuesday when Dragon Age Origins comes out. really good PC RPG. Hopefully it'll be as good as it looks.